We’re getting to the end of the hockey season around here. Each year, if we’re lucky, we get a stretch of black ice on the pond. If we’re willing to shovel snow, and the ice is smooth underneath, we set out winter boots as goals and play pick-up games. 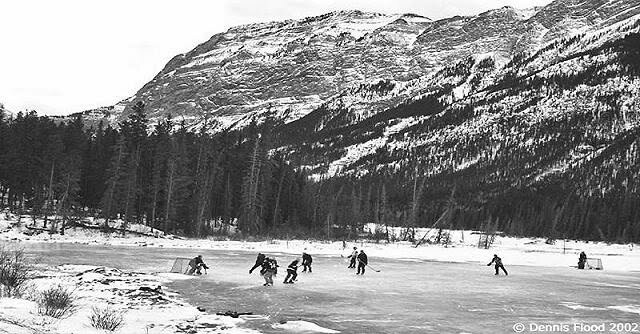 Some years, the pond-hockey season lasts most of the winter. A few years ago, a friend of Jim’s invited him to join an indoor hockey league. That was Jim’s introduction to the world of hockey as a lifetime sport. He discovered that the local woodwork is crawling with former high school and college players, men and women — and that his skills needed a bit of work. He joined a learn-to-play group, then found a coed team, the Slapsticks, that plays late at night twice a week, which is as good as it gets for a working dad. The group draws players from seven or eight towns; Jim isn’t the only one willing to drive an hour each way for 90 minutes of ice time. In the Upper Connecticut River Valley, March means “mud league,” when the indoor teams can sign up to play in a massive round-robin tournament. The Slapsticks don’t go that route. 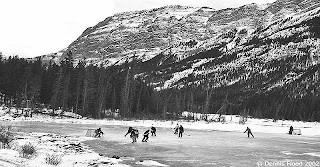 Instead, they continue to gather late at night, throw their sticks into the middle of the ice, pond-hockey style, and let a player separate them randomly into opposing teams. Virgil has been asking all season if he can watch one of those games, and maybe even play in one. Finally, one night last week, even though it was pretty late for a second-grader, he rode in with his dad and another Slapsticks player, a duffle bag of hand-me-down skates and hockey gear at his feet. He skated with the team during warm-ups. Even better, at the end, just before their ice time was up, the players invited Virgil to join one of the sides. With everyone’s help, he scored a goal. On the way back, he fell asleep in the car, a happy boy. I thought about all of this again recently, when Jim forwarded an email from Mariel Lacina, a goalie for the Dartmouth women’s hockey team. She graduates this year, but as she explained when I called her, she wants to extend her love of the sport by extending its reach into area schools. She’s not talking about rink time, though, or even organized teams. What she understands is that kids learn to love a sport — whether it’s hockey or baseball, soccer or skiing — when they get to play it for fun, and for free. As a kid growing up in London, Ontario, Mariel learned to play hockey on makeshift rinks in friends’ yards, on shallow bogs around the neighborhood that froze solid in the winter, and on bigger ponds that the town maintained. Even after she started playing on teams, she continued to play what they called “shinny,” the same pick-up games that we play on our pond. “You grab your stick and your skates, and you’ve got your day planned,” she said. Earlier this winter, the grandfather of a young Dartmouth fan invited Mariel and the rest of the women’s team to visit a local elementary school. The school has an outdoor rink, but when Mariel got onto the ice to skate with the kids, she saw that almost none were wearing skates. She asked around and learned that very few owned skates; she asked more questions and it became clear that, for many of the kids in that community, hockey was something rich kids did, not them. “It’s true that gear is pretty expensive when you get to the college level,” Mariel told me. “But I grew up wearing other kids’ hand-me-downs.” To get started, she said, all she needed was "a pair of skates and a stick.” That’s all local kids need, too. So Mariel started collecting used hockey gear from her teammates and from teams like the Slapsticks. She’s created a website, and she’s talking to the principal at the school she visited about getting skates and sticks to those kids, so they can learn to play the way she did. Chances are, some of them will get hooked — and hockey will become a lifetime sport for them, too. - Mariel Lacina's Green Gear website. - An Internet search brought up an article about a similar program in New Jersey. I hope you'll add information about other such programs below. Photos: pond hockey; Mariel Lucina with donated gear.